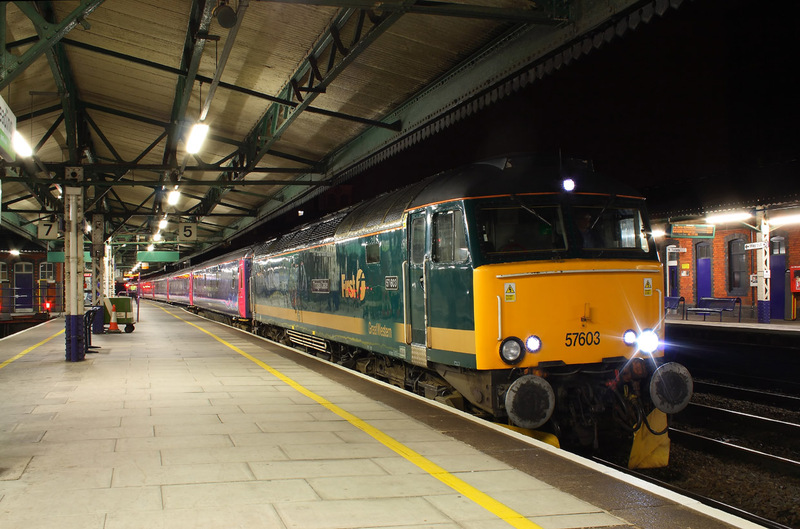 57605 Top and 57604 Tailing on 5A40 07.15 Paddington to Reading Traincare depot sleeper ECS via the Chiltern line to Oxford. 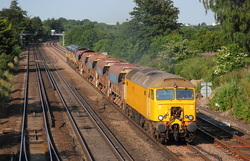 57306"Her Majestys Railway Inspectorate"+ failed 57605"Totnes Castle" 5A40 07.10 Newton Abbot to Reading Traincare Depot empty sleeper stock. 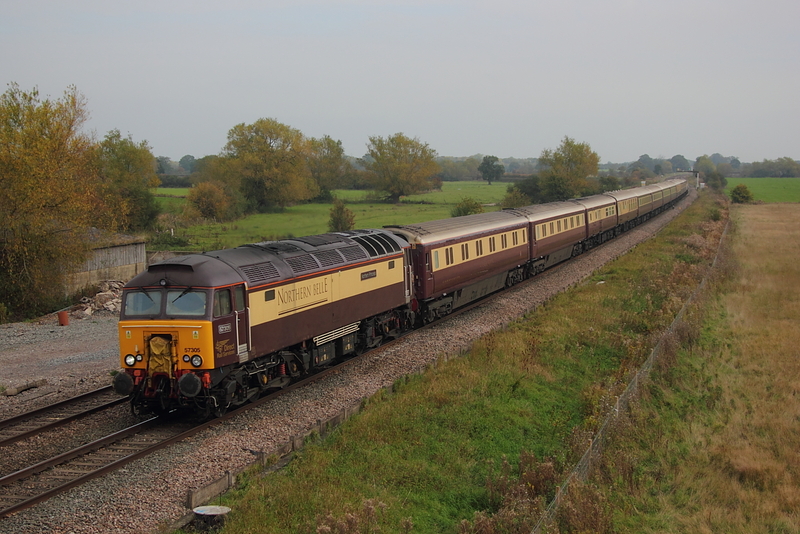 57313 and 47804 tailing on 1Z94 06.10 Derby to Bath ,Salisbury and Bath Statesman tour. 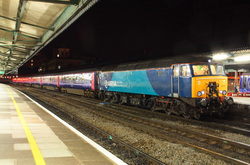 After appearing to have come to a halt in the Birmingham area,according to RTT,and no information to its exact whereabouts, and totally unprepared,57306"Her Majestys Railway Inspectorate" came into view ON TIME ,with 1Z57,the Northern Belle departing from Kidderminster at 06.21 heading to Hove,with 57301"Goliath" on the rear.Lucky it was Signal checked and not flying past. 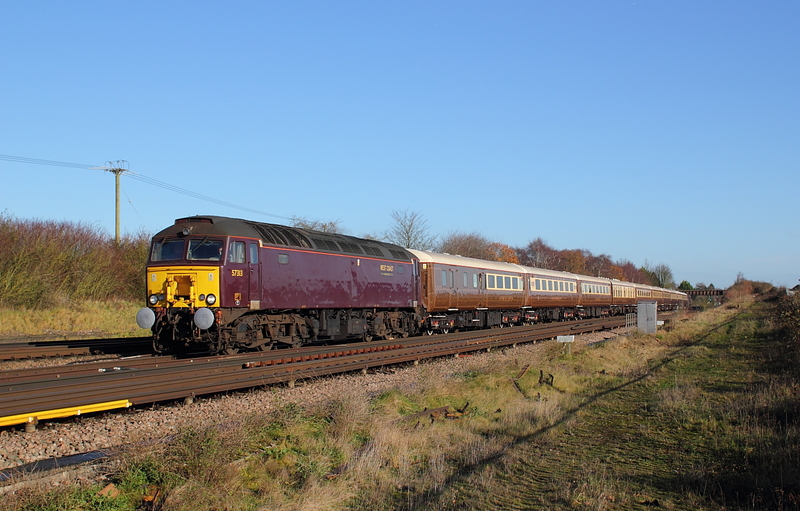 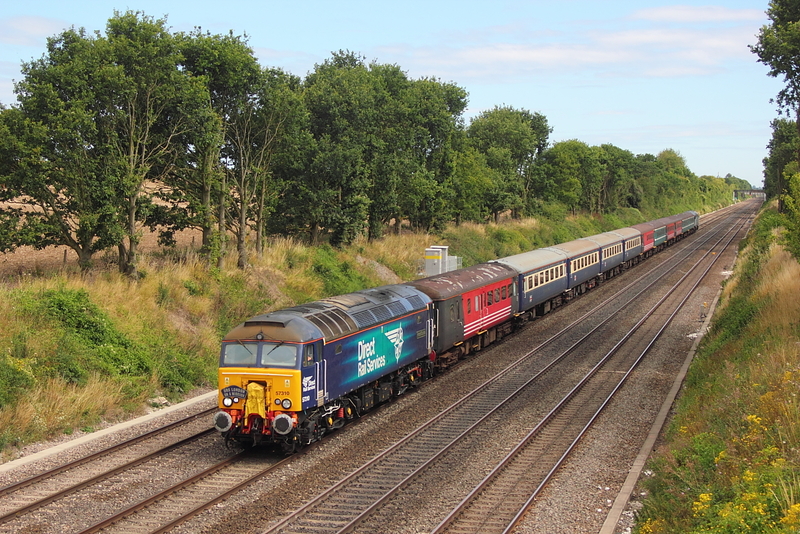 After showing as cancelled on RTT ,5Z57 appeared some 20 min late,and paired instead of the booked top and tail scenario,so helping the light angle somewhat.57316+57601 DIT on the 12.35 Ely to Carnforth Steamtown ECS,making this a added bonus for the day. 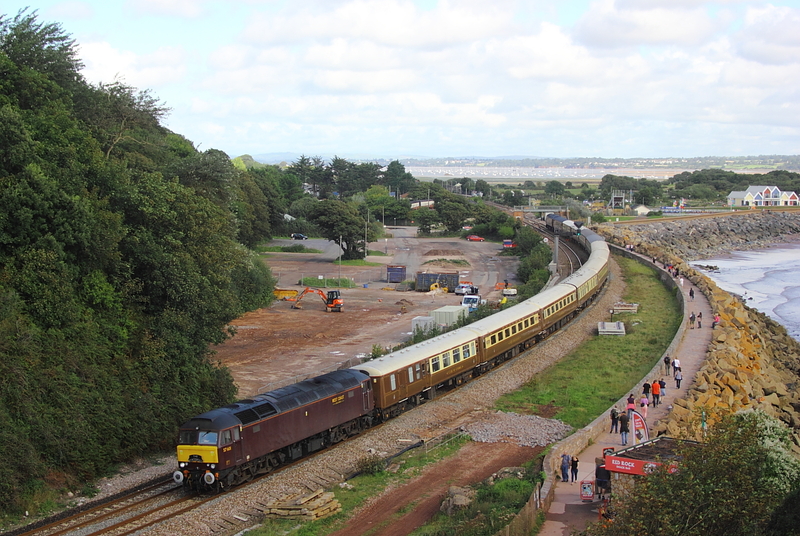 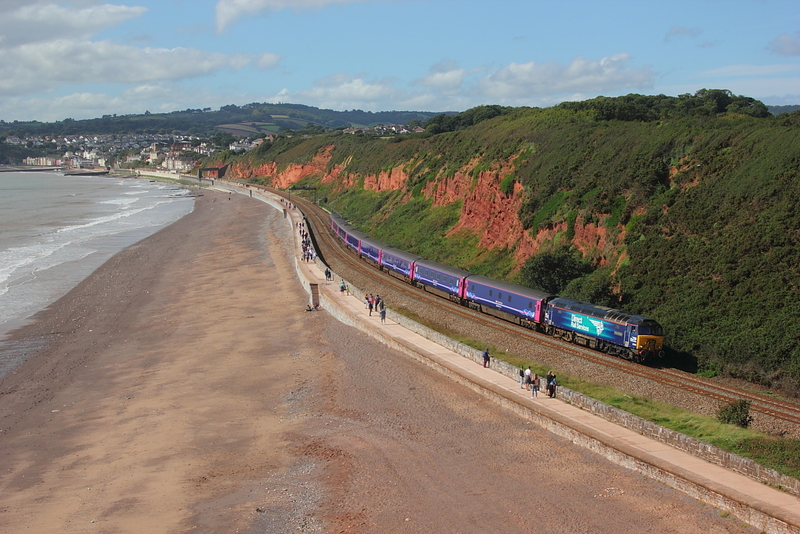 Looking down from the viewpoint at Langstone Rock 57303"Pride of Carlisle" approaches Dawlish Warren with 5Z40 09.20 Penzance T&R.S.M.D. to London Paddington sleeper empty stock. 57307"Lady Penelople" 5Z39 14.44 Eastleigh Arlington to Bournemouth ECS,with 37401+37405 on the rear. 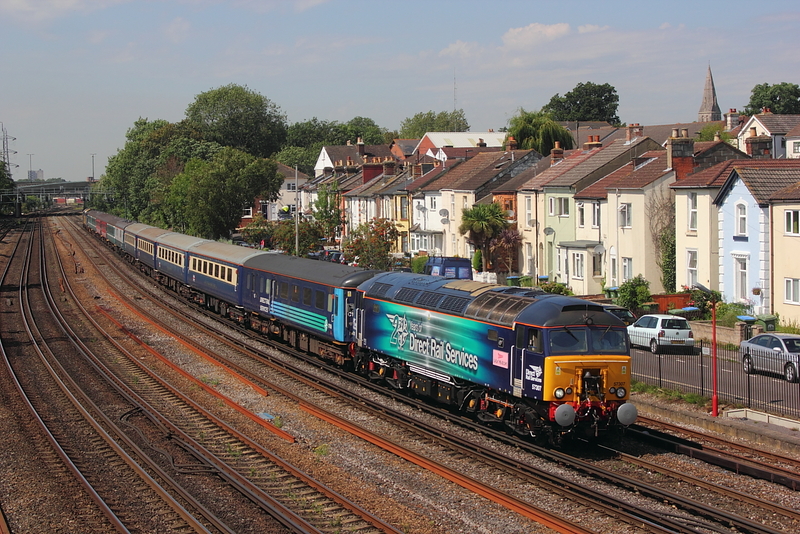 57307 still with its Thunderbird nameplate ,"Lady Penolope" passes with 5Z38 12.53 Bournemouth to Eastleigh Arlington "The Bournemouth Flyer" ECS with 37401+37405 on the rear. 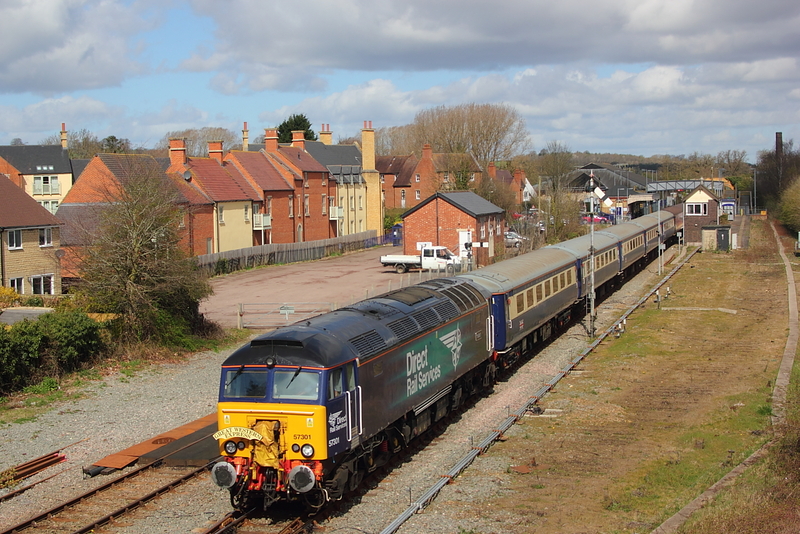 57301"Goliath" and 57310"Pride of Cumbria" on the rear of 1Z58 15.53 Oxford to Hooton,the returning Great Western Express tour organised by the Chester Model Railway Club. 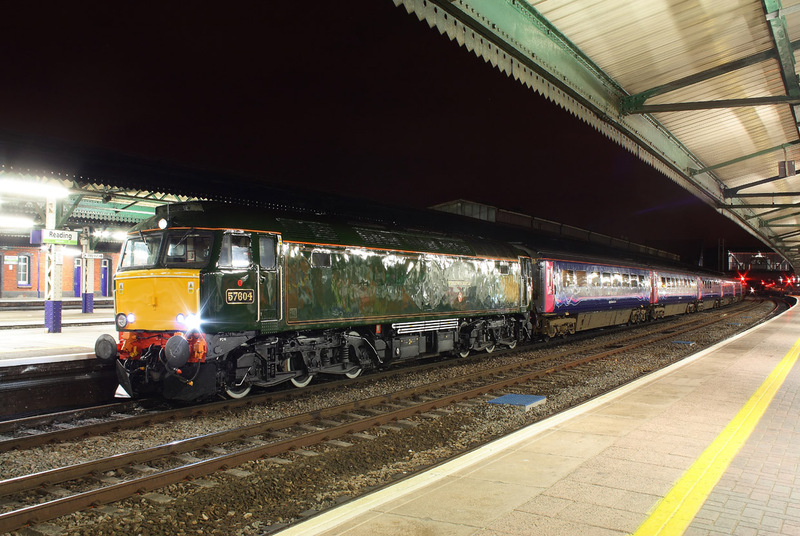 DRS 57301"Goliath" with 57310"Pride of Cumbria" on the rear of the Great Western Express tour organised by Chester Model Railway Club,running as 1Z57 07.20 Hooton to Oxford. 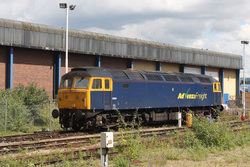 After both Colas 66846+66849 failed on 5 autoballasters,56306 was sent to rescue the assemble,returning as 6C70 Effingham Jnct. 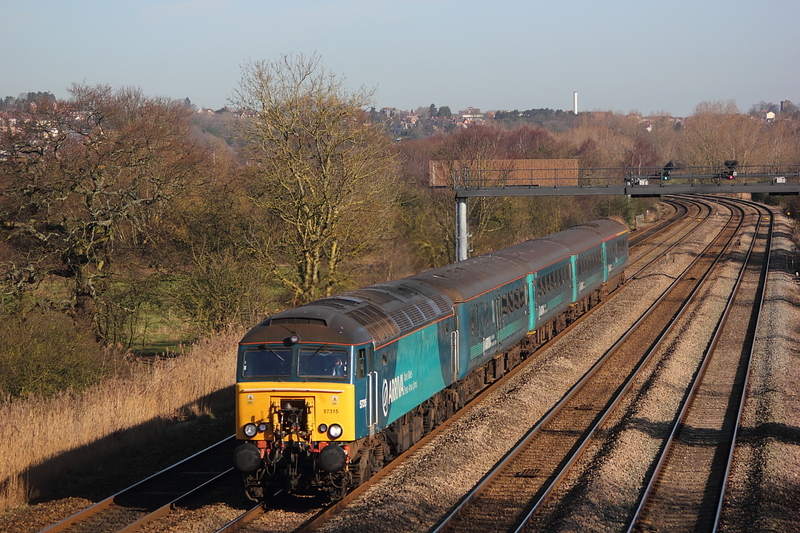 to Eastleigh,with the disgraced pair on the back. 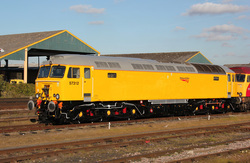 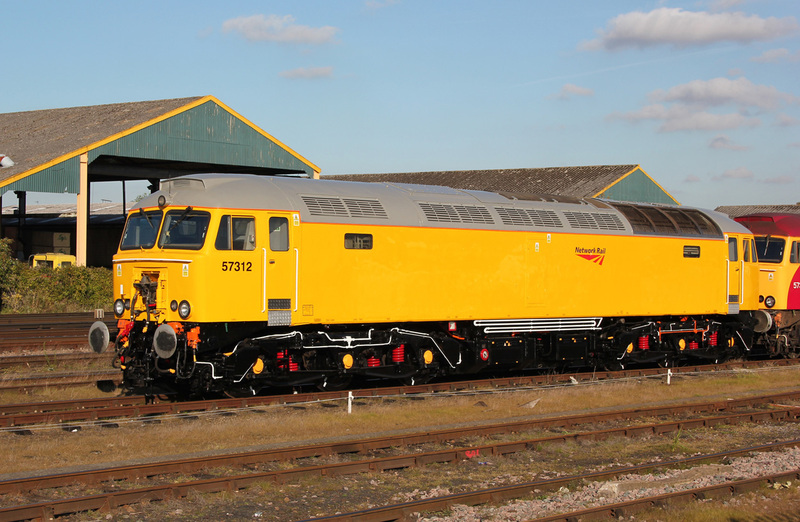 Having been hauled to Eastleigh yard from the works,by 57310,Ex works 57312 sits ,with its freshly applied Network Rail yellow paintwork gleaming. 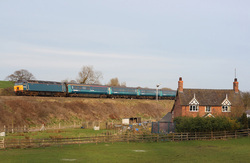 Expecting the first Taunton to Cardiff service at another location,i was dissapointed to find out that problems with stock meant that the first working would be the 11.02 from Taunton,so i ended up here at Creech St Michael,to phot 57305"John Tracy" pass on 2U14,with 66721 on the rear. 57605"Totnes Castle"pauses at Reading station on 1C99,the 23.45 Paddington to Penzance sleeper. With the summers evening being quite warm,an attempt was made to bag newly painted 57604 "Pendennis Castle" on the Paddington to Penzance sleeper,not on the preffered platform but this will have to do,as loosing to much shut eye on previous attempts.Here it pauses at Reading with 1C99,the 23.45 from the capital. 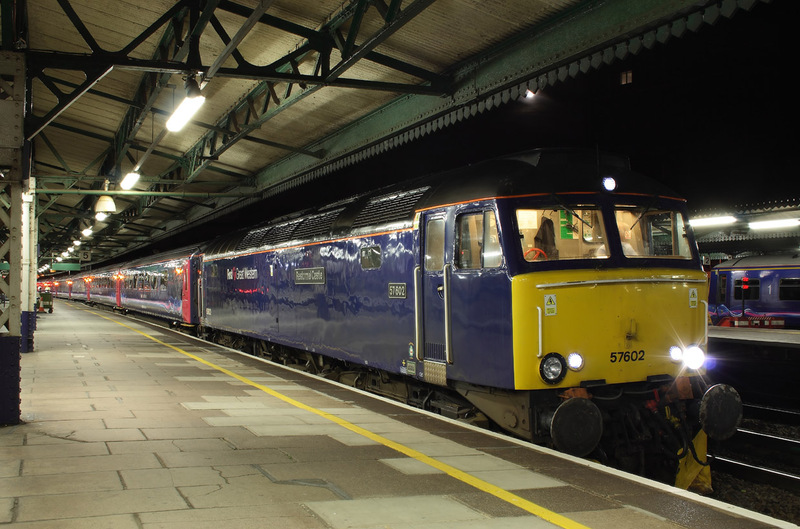 57602"Restormal Castle"1C99,23.45 Paddington to Penzance sleeper. 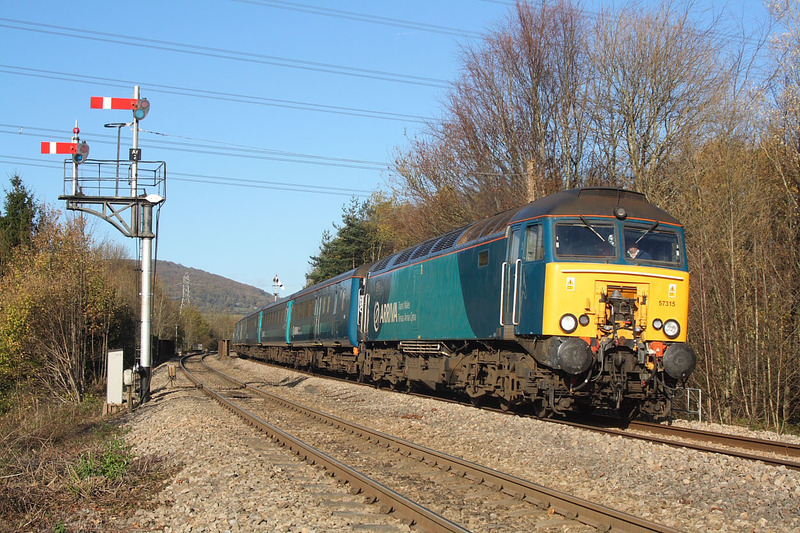 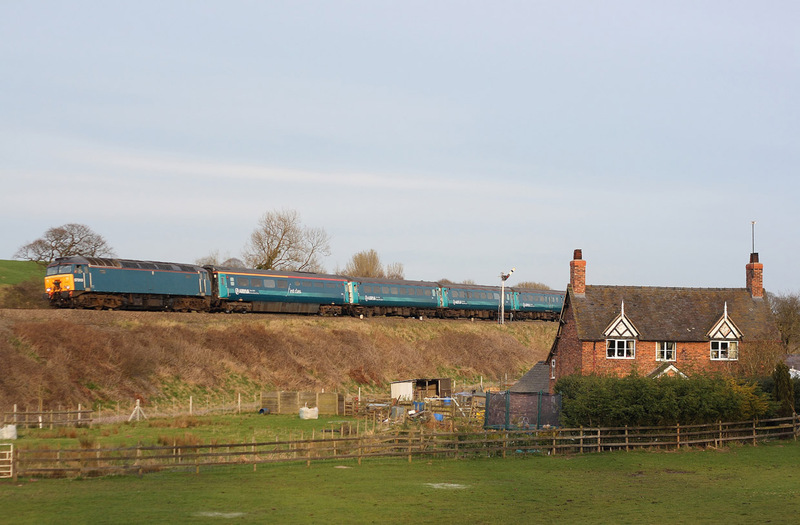 57315 passes near Abergavenny with 1V77,08.20 Holyhead to Cardiff. 57604"Pendennis Castle"1C99,23.45 Paddington to Penzance sleeper. 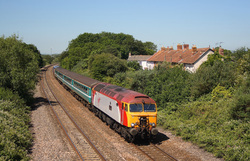 57305"John Tracy" and 57308"Tin Tin" on the rear of 2C79..14.00 Cardiff to Taunton. 57308"Tin Tin" leads 2U14..11.02 Taunton to Cardiff ,with 57305"John Tracy" bringing up the rear. 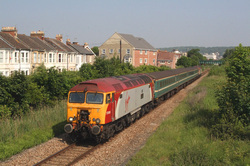 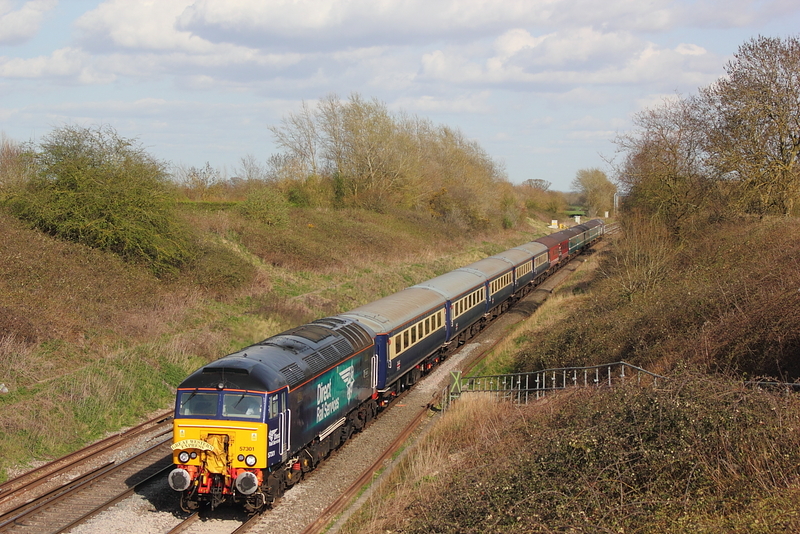 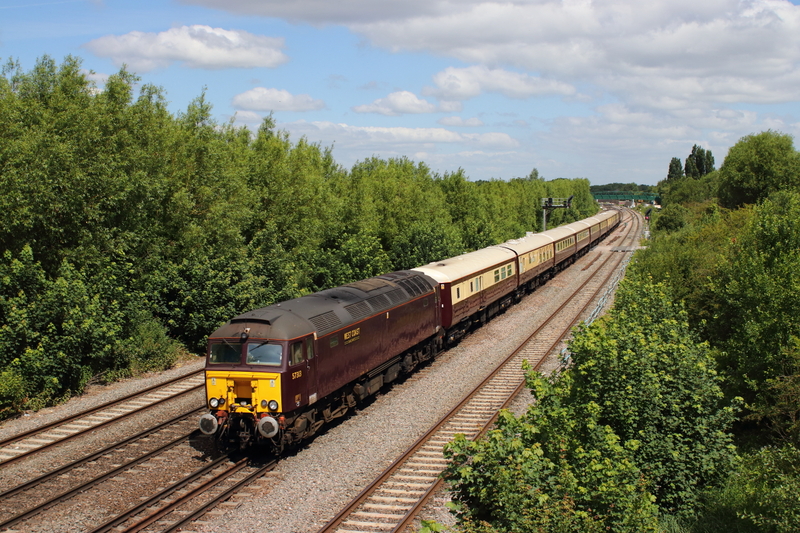 57305"John Tracy" powers away from Weston Super Mare with 5Y10 ECS to Taunton,with 57308"Tin Tin" on the rear. 57603"Tintagel Castle" pauses at Reading Station on 1C99,the 23.45(Mon) Paddington to Penzance sleeper service. 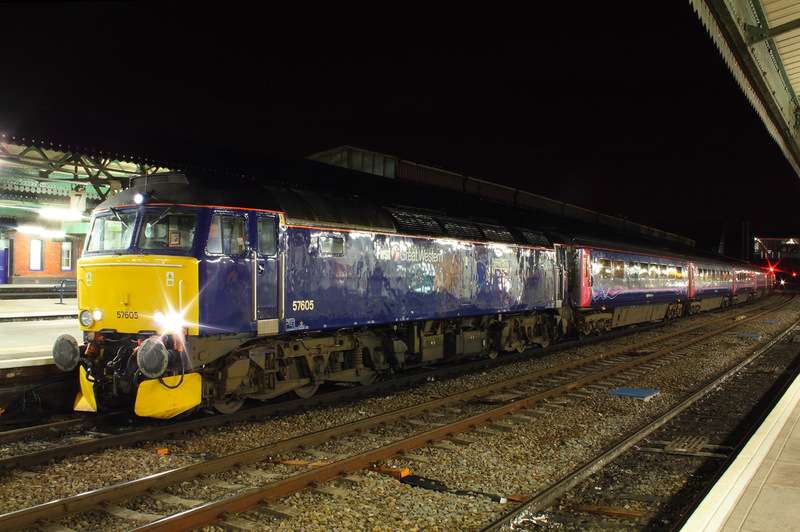 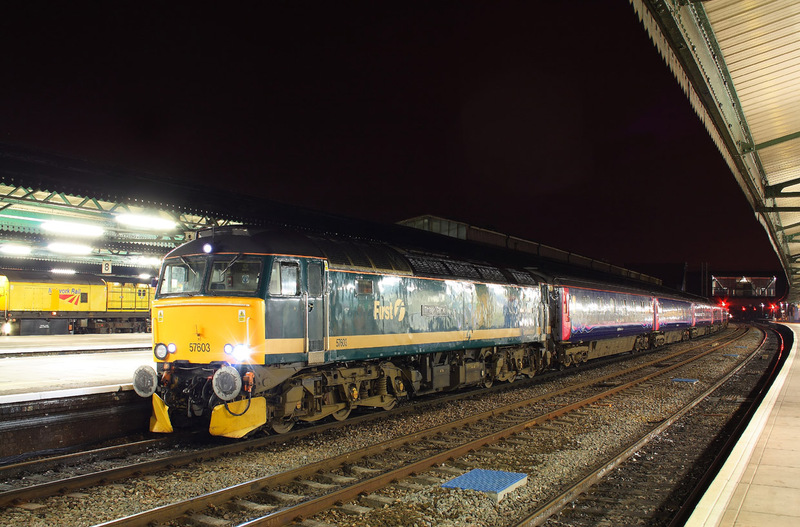 57603"Tintagel Castle"pauses at Reading Station on 1C99 ..23.45(Mon) Paddington to Penzance sleeper service. 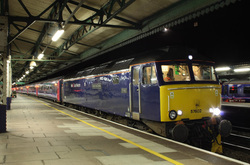 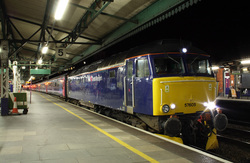 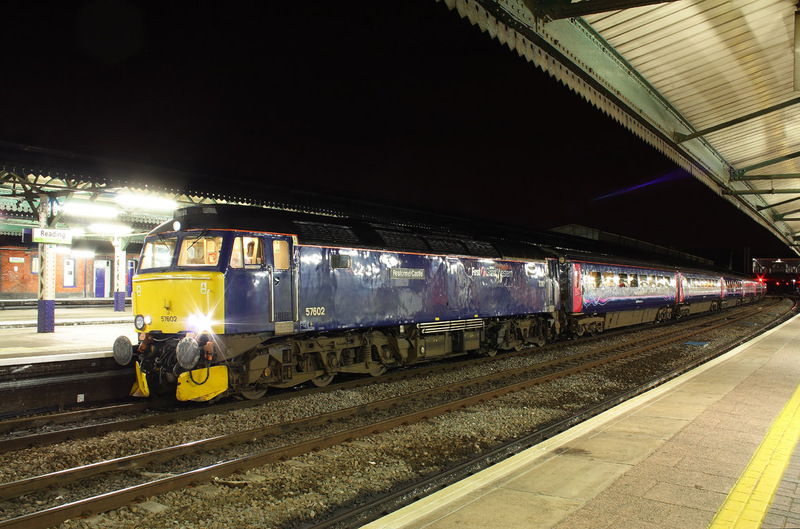 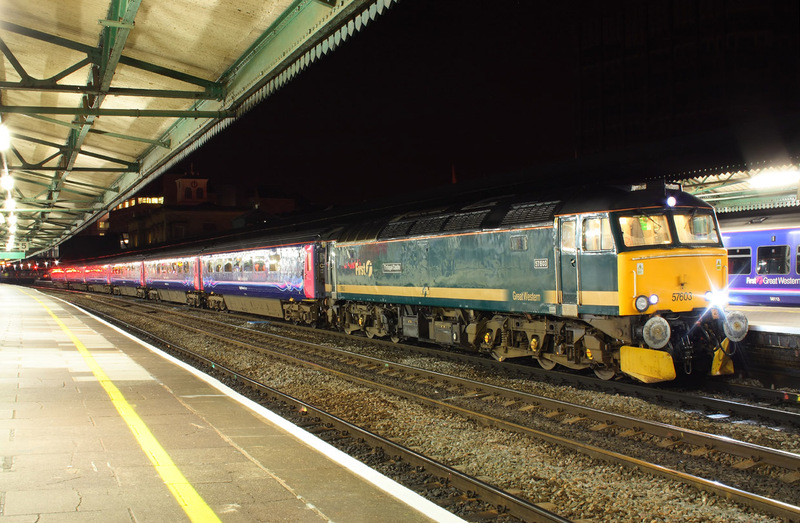 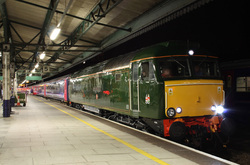 57603"Tintagel Castle"1C99..23.45(Tue) Paddington to Penzance sleeper. 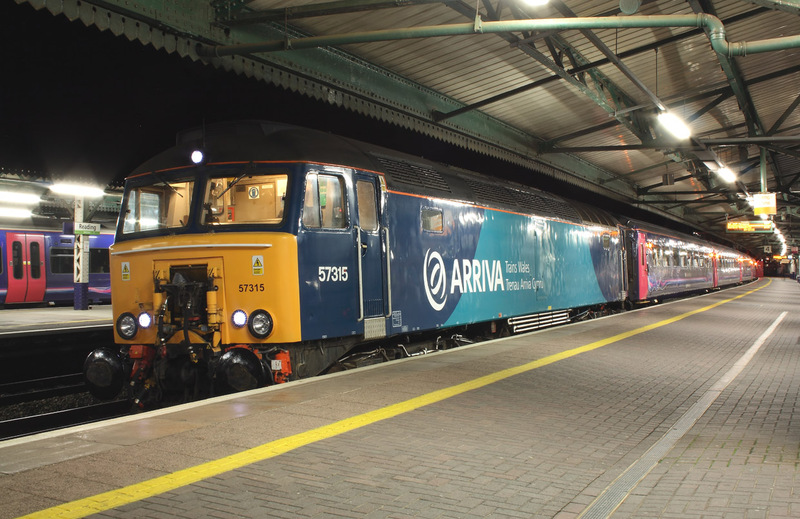 Hired in Arriva 57315 pauses at Reading on 1C99,the 23.45(Mon) Paddington to Penzance sleeper. Hired in Arriva 57315 pauses at Reading on 1C99(23.45)Paddington to Penzance sleeper. 57313(57315 on the rear out of sight)..1W91..16.19 Cardiff to Holyhead. 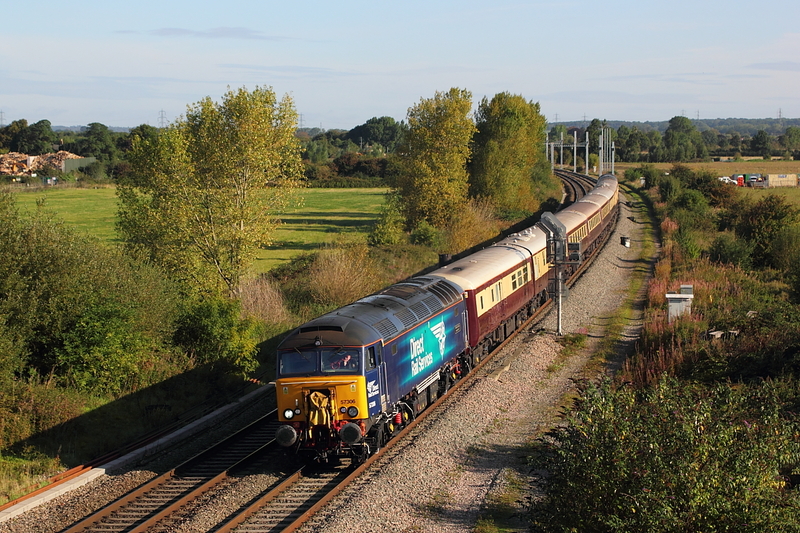 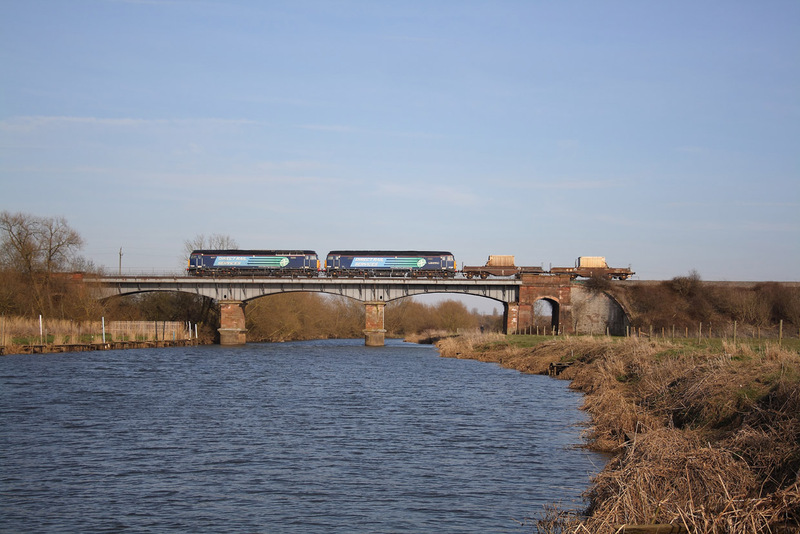 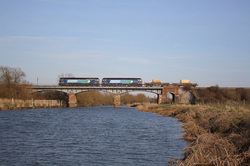 DRS 57009+57008 cross the River Avon at Eccington working 6M57,the Bridgewater to Crewe nuclear flasks. Not long before the company went bust,Advenza's 57005 sits at Gloucester Station. 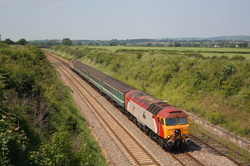 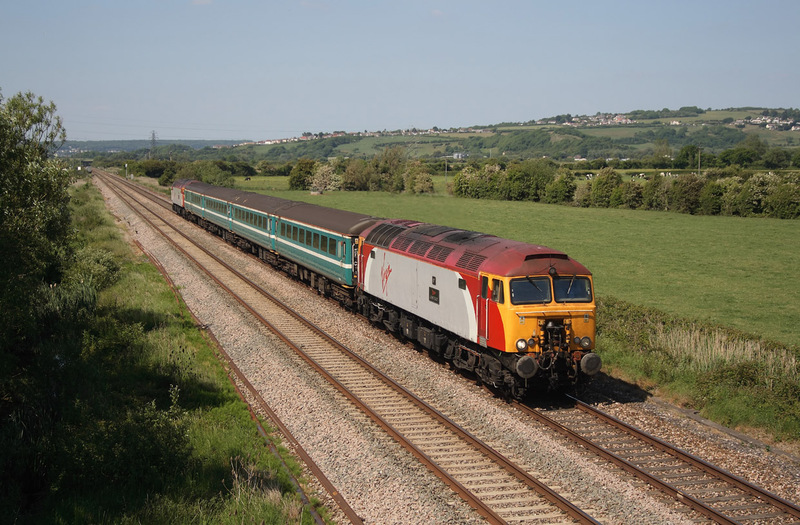 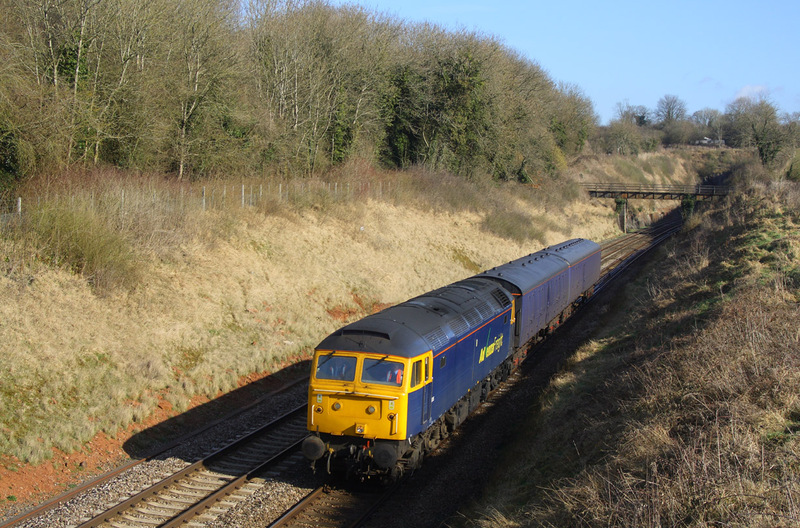 57006..5Z77 Gloucester to Laira barrier coaches.